For the battle that took place during the late Han Dynasty, see Battle of Xiangyang (191). The Battle of Xiangyang (traditional Chinese: 襄陽之戰; simplified Chinese: 襄阳之战; pinyin: Xiāngyáng zhizhàn) was a key battle between the invading Mongols of the Yuan dynasty and Chinese Southern Song forces from CE 1267 to 1273. After the battle, the victorious Mongol forces pushed farther into the Chinese heartland. Previously for 30 years, Song China managed to handle several major offensives by the Mongol Empire. The strategic significance of Xiangyang came from the fact that it was in a position dominating the Han river. Once the Mongol forces occupied Xiangyang, they could travel by ships down the Han river into the Yangtze river. After the Battle of Xiangyang, China could not enjoy the protection of natural barriers any more and so it collapsed in just a few years, with the final battle being the relatively short naval Battle of Yamen in 1279. The battle consisted of skirmishes, ground assault, and the siege of the twin fortified cities of Fancheng and Xiangyang in modern-day Hubei, China. Lü Wenhuan, commander-in-chief of the Southern Song dynasty, surrendered to Kublai Khan in 1273. The conventional use of Mongolian cavalry was restricted by the woody terrain and numerous military outposts of China. Chinese firearms and cannons were employed by the Mongols in the victorious siege of Fancheng after capturing the outposts and relieving Chinese forces from Sichuan and Yuezhou, which broke through the siege but was eventually defeated. The use of the counterweight trebuchet by the Mongols proved especially effective. Before the rule of Kublai Khan, the Mongols had launched military campaigns as far as Eastern Europe, and had conquered Russia, Siberia, Tibet, Korea, North China, Yunnan, Iraq, Anatolia and Iran. However, the Song dynasty was difficult to conquer because of the strategic location of Xiangyang, which became a vital position for Kublai to capture and hold. The city guarded the waterways of South China because the Han River was a major tributary into the Yangtze River. Once the city fell, the Mongols obtained easy access into important Southern cities in China and the Southern Song would collapse shortly after. The Southern Song knew the importance of this vital spot, and treated the defense of Xiangyang as important as their capital. The city was surrounded by mountains on three sides, and a river (Han river) on one side. Song stored massive amount of supplies inside the fortress, as preparation for long sieges. They also built high walls and towers on all four sides of the fortress. Each entrance of the fortress had at least two layers of walls, used to trap enemy sieging forces inside. In 1133, the famous Song general Yue Fei led many successful campaigns against the Jin dynasty, in the Xiangyang area. From there, he pushed the Jin army back north as far as Kaifeng. In 1234, the Jin dynasty was conquered by the Mongols under the leadership of Ögedei. At that time, Mongols and the Southern Song dynasty were allies. After that, the two former allies did not have any common enemy. The Song killed Mongol envoys and attempted to invade the Mongol territories. Xiangyang surrendered to the army of the Mongol Empire without resistance in 1236. But the Mongols voluntarily left the city after it was briefly held by them in 1236-38. The twin cities of Xiangyang-Fenchang, with walls almost 5 kilometers around and 200,000 people, withstood a Mongol assault in 1257. The Mongolian cavalry were lured in Xiangyang where they were slaughtered by the Song defenders due to the fortress' double layered wall design. When a Mongol contingent entered the entrance of the fortress, the Mongol forces would be slaughtered to the last man, while trapped between 4 walls. Mongols lifted the siege of Xiangyang. The sudden death of Möngke Khan forced the imperial army of the Mongol Empire to withdraw from the Song territory in 1259-60. In 1260, Kublai Khan was proclaimed successor to the throne after the death of his brother Möngke, as was his youngest brother Ariq Böke. The succession war between him and Ariq Böke began. Kublai Khan won the war eventually, though his claim as the successor to Möngke was only partially recognized by the Mongols in the west. In 1271, Kublai Khan renamed his empire "Yuan", establishing the Yuan dynasty, instead of "Ikh Mongol Uls" (Great Mongolian Nation or Great Mongol Empire). After defeating his rivals and opponents in Mongolia and Northern China, Kublai Khan also wanted to continue his grandfather Genghis Khan's conquest of China. In 1267, Kublai Khan ordered Aju and the Song defector Liu Zheng to attack Xiangyang and Fencheng. Aju and Liu Zheng arrived in 1268 and blockaded the city with a ring of forts. The Mongols probed the defence of Xiangyang and Fancheng. The Yuan-Mongols learned from their mistake, and this time brought along with them about a hundred trebuchets. These trebuchets had a shooting range of around 100 meters, and could use projectiles of around 50 kg. During Mongol campaigns against the Jin dynasty, the Mongols used about 5,000 trebuchets, and they were very successful in destroying the Jin fortresses. Lv Wende commanded the Song dynasty's Yangtze and his son-in-law Fan Wenhu and son Lv Wenhuan commanded Xiangyang. However the twin cities had expected an assault by bombardment and prepared for it. The city moat was expanded to a width of 150 meter, forcing Yuan siege weapons to set up at a distance. In addition to reinforcing their walls with clay, they made netting screens ten centimeters thick and ten meters in length to cover them and dampen projectile impact. As a result, the Yuan siege weapons were both ineffective and inaccurate, and the few shots that did land bounced off the wall harmlessly. The Mongols then started to block Xiangyang off from the rest of Song. A Yuan fleet of 5,000 ships was established, to stop any Song supplies from the Han river. The Han River was blockaded with five stone platforms capped by arbalests. The Mongol trained 70,000 marines but Song food supplies still held out in 1271. The Yuan also sent forces to go around the fortress, and set up camps at the key roads, to stop Song supplies from land. Eventually, Yuan built their own forts at these key locations. From late 1267 to 1271, Song reinforcements from the south tried, many times, to attack the Mongol positions, in order to supply Xiangyang, but outside of Xiangyang, the Song forces were no match for the Mongolian cavalry. The catalogue of useless thrusts continued, the Chinese losing 1,000 in October 1270, 2,000 in August 1271, and most of a 3,000 strong force was destroyed the following month. Once the Yuan forts were completed, the situation became hopeless. As a result, the Song forces inside Xiangyang had to depend on themselves. Song had stored years of supplies within Xiangyang. However, by 1271, the fortress finally ran low on their supplies. Still, the Song troops chose to hang on. Finally, in 1272, a small Song force of 3,000 men was able to break through the Yuan naval blockade, and supplied Xiangyang from the Han river. This was a major morale boost to the defenders. However, no one could get back out to inform others of the success. The Song officials considered that reinforcement lost and Xiangyang, doomed to fall from the lack of supplies, did not send more Song reinforcements afterwards. The high casualties and low success rates ended the transportation of further supplies. Aju realized that the twin cities were hard to be taken by the Mongol cavalry and wrote Kublai that he needed the Chinese infantry. Kublai strengthened him with 20,000 men. The defence of Xiangyang came to an end in 1273, with the introduction of the counterweight trebuchet. Because the Han Chinese commander Guo Kan fought with the Mongols under Hulagu in the Middle East, Kublai had heard of siege engines of great effectiveness. Experts Ismail and Al al-Din were sent by Abagha, Ilkhan of Persia, to China by the decree of Kublai Khan in 1272. They built the powerful mangonels under the Uyghur general Arikhgiya by March, 1273. These counterweight trebuchets had a shooting range of 500 meters, and could launch projectiles weighing over 300 kg. On top of their power, these new trebuchets were much more accurate than the old ones, and were the only artillery capable of reaching the walls of Xiangyang. Yuan forces built about 20 of them, and used them to assist the siege of Xiangyang. The Mongols started the siege with Fancheng in early 1273. Song soldiers in Xiangyang witnessed a giant rock which flew right over the gigantic walls of Fancheng, and hit the houses inside. Under the cover of bombardment, the Yuan army was able to fill the moat and take the walls, after which followed an assault by a cavalry. Fancheng, after holding out for years, suddenly fell within a few days. The Yuan Mongol army then turned their attention to Xiangyang. Lv Wenhuan sent a messenger to Emperor Duzong of Song, to request immediate reinforcements. The messenger successfully got by the Yuan forts and reached the emperor. But upon hearing the effectiveness of these new trebuchets, the emperor considered Xiangyang lost and did not send reinforcements. For the next few days, Song soldiers looked to the south for reinforcements, but all they saw were Yuan siege weapons and the Mongols waiting to end their lives. The position of Song forces worsened. In February, Yuan siege weapons began bombarding the city and a shot happened to hit a stone bridge inside. When the stone landed, it made a thunderous noise. Song soldiers went to check the damage, and saw that the stone had sunk a few feet into the solid ground. Yuan bombardment began to collapse the city structures as well as reduce the drum tower and turrets on the city walls. Lv Wenhuan surrendered the city on 14 March 1273; he was made governor of Xiangyang and Fancheng under Yuan rule as part of the terms. Xiangyang, the strongest fortress of the Song dynasty, had fallen. As a result, Yuan forces were free to conquer the rest of southern China. Everywhere else Yuan went, Song fortresses fell like sand castles, due to the counterweight trebuchets and later, cannons. In 1275, the Song government unsuccessfully attempted to form a truce, but by then the act was too late. Many people agree that the fall of Xiangyang essentially marked the end of the Song dynasty. For example, Paul K. Davis wrote, "Mongol victory broke the southern Sung dynasty, leading to the establishment of the Yuan dynasty." For the six years that Yuan sieged Xiangyang, Song were unable to regroup and strike back at Yuan with their resources in the south. In fact, they could not even get much reinforcements and supplies to Xiangyang, to support the hard-working defense there. The emperor of the Song dynasty abdicated on 4 February 1276. Both the Song and Mongol forces had thunder crash bombs during the siege, a type of gunpowder weapon. The Mongols also utilized siege crossbows and traction trebuchets. The Song forces used fire arrows and fire lances in addition to their own thundercrash bombs. The Song forces also used paddle ships. Siege crossbows and firebombs were also deployed on Song ships against Mongol forces, in addition to fire lances. The name of the bombs in Chinese was Zhen tian lei. They were made from cast iron and filled with gunpowder, the Chinese Song forces delivered them to the enemy via trebuchets. Armor made out of iron could be penetrated by pieces of the bomb after the explosion, which had a 50 kilometer noise range. Since the Yuan employed Muslim engineers for the designing of the counterweight trebuchets, they were designated in Chinese historiography as the "Muslim" trebuchet (hui-hui pao). The Chinese scholar Zheng Sixiao (1206–83) indicates that, "in the case of the largest ones, the wooden framework stood above a hole in the ground". 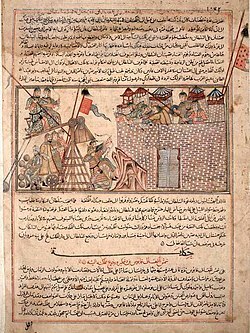 After Aju asked Kublai, the Emperor of the Mongol Empire, the powerful siege machines of the Ilkhanate, Ismail and Al-aud-Din from Iraq arrived in South China to construct a new type of trebuchet which used explosive shells. These Muslim engineers built mangonels and trebuchets for the siege. Explosive shells had been in use in China for centuries but what was new was the counterweight type of trebuchet as opposed to the torsion type giving greater range and accuracy as it was easier to judge the weight of the counter weight than the torsion generated by repeated windings. A city under Mongol siege. From the illuminated manuscript of Rashid al-Din's Jami al-Tawarikh. Edinburgh University Library. The counterweight trebuchet built by the Muslims from Mosul were longer in range, and assisted in destroying Fancheng. Chinese and Muslim engineers operated Artillery and siege engines for the Mongol armies. The design was taken from those used by Hulegu to batter down the walls of Baghdad. The Chinese were the first to invent the traction trebuchet, now they faced Muslim designed counterweight trebuchets in the Mongol army. The Chinese responded by building their own counterweight trebuchets, an account from the Chinese said in 1273 "the frontier cities have all fallen. But Muslim trebuchets were constructed with new and ingenious improvements, and different kinds became available, far better than those used before." The Chinese scholar Zheng Sixiao (1206–83) indicates that, "in the case of the largest ones, the wooden framework stood above a hole in the ground". Another version is given by Marco Polo in his book Il Milione where he claims having been responsible for teaching the Mongols how to build and use catapults during the siege of Xiangyang. However, the names of the Muslim engineers were given by Muslim sources as Talib and his sons Abubakr, Ibrahim, and Muhammad, respectively by Chinese sources as Ala-ud-Din and Isma'il. Moreover, it has been claimed the siege had already ended before Marco Polo's arrival in China. Political infighting among the Song also contributed to the fall of Xiangyang and Fancheng; due to the power of the Lv family, many questioned their alleigance to the Song. The Emperor barred Jia Sidao himself from the command, so Li Tingzhi, an enemy of the Lv family, was appointed commander. Jia permitted the Lvs to ignore Li's orders, resulting in a fractious command. Li was then unable to relieve Xiangyang and Fancheng, managing only temporary resupply during several breaks in the siege. ^ a b c d e Peter Lorge (25 October 2005). War, Politics and Society in Early Modern China, 900–1795. Routledge. pp. 84–87. ISBN 978-0-203-96929-8. ^ "The Mongol Siege of Xiangyang and Fan-ch'eng and the Song military » De Re Militari". deremilitari.org. Retrieved 2017-11-11. ^ Paul K. Davis, 100 Decisive Battles from Ancient Times to the Present: The World's Major Battles and How They Shaped History (Oxford: Oxford University Press, 1999), 142. ^ Stephen Turnbull (2002). Siege weapons of the Far East: CE 960-1644 (illustrated ed.). Osprey Publishing. p. 12. ISBN 1-84176-340-3. Retrieved 2010-10-28. ^ Stephen R. Turnbull (2003). Genghis Khan & the Mongol conquests, 1190-1400 (illustrated ed.). Osprey Publishing. p. 63. ISBN 1-84176-523-6. Retrieved 2010-10-28. ^ Matthew Bennett (2008). Matthew Bennett, ed. The Hutchinson dictionary of ancient & medieval warfare. Taylor & Francis. p. 356. ISBN 1-57958-116-1. Retrieved 2010-10-28. ^ Morris Rossabi (28 November 2014). From Yuan to Modern China and Mongolia: The Writings of Morris Rossabi. BRILL. pp. 229–. ISBN 978-90-04-28529-3. ^ Jasper Becker (2008). City of heavenly tranquility: Beijing in the history of China (illustrated ed.). Oxford University Press. p. 64. ISBN 0195309979. Retrieved 2010-10-28. ^ Stephen Turnbull; Steve Noon (2009). Chinese Walled Cities 221 BC-AD 1644 (illustrated ed.). Osprey Publishing. p. 53. ISBN 1846033810. Retrieved 2010-10-28. ^ Michael E. Haskew; Christer Joregensen; Eric Niderost; Chris McNab (2008). Fighting techniques of the Oriental world, CE 1200-1860: equipment, combat skills, and tactics (illustrated ed.). Macmillan. p. 190. ISBN 0312386966. Retrieved 2010-10-28. ^ René Grousset (1970). The Empire of the Steppes: A History of Central Asia (reprint ed.). Rutgers University Press. p. 283. ISBN 0813513049. Retrieved 2010-10-28. ^ Stephen R. Turnbull (2003). Genghis Khan & the Mongol conquests, 1190-1400 (illustrated ed.). Osprey Publishing. p. 63. ISBN 1841765236. Retrieved 2010-10-28. ^ Wood, Frances (1995). Did Marco Polo go to China?, London: Secker & Warburg, pp. 107-108. ^ Peter Allan Lorge (2005). War, politics and society in early modern China, 900-1795 (PDF). Taylor & Francis. p. 84. ISBN 0-415-31690-1. Archived from the original on Aug 23, 2010. Retrieved 2010-10-28. ^ Fang, Cheng-Hua. 2003. “Military Families and the Southern Song Court— the Lü Case”. Journal of Song-Yuan Studies, no. 33. Society for Song, Yuan, and Conquest Dynasty Studies: 49–70. https://www.jstor.org/stable/23496108.